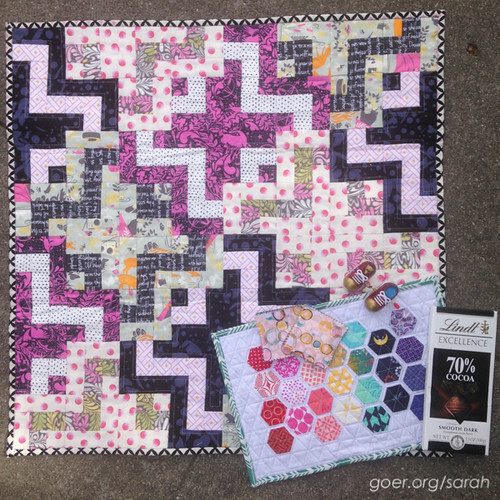 Leasa hosted the Sew My Stash Mini Quilt Swap on Instagram. The shipping window ended earlier this week and my partner Kathryn received her package yesterday. Right around the time that our first check in photo was due, I was working on my first Swoon block. I sew a second line of stitching 1/2" from the first where triangles are going to be trimmed off so I'll automatically have HSTs that just need to be trimmed to size. (See an example in step 4 of my Watermelon Plate Tutorial.) 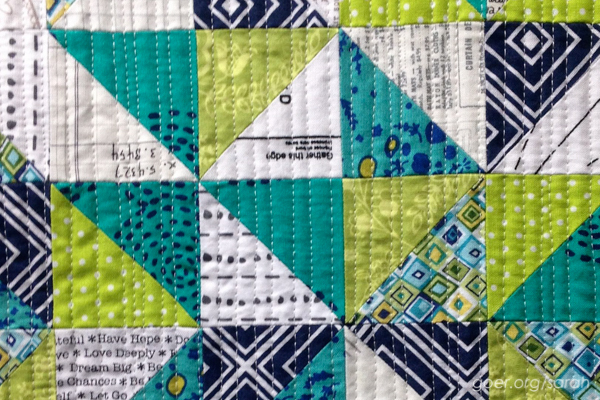 I had stitched these HSTs (trimmed down to 2.5" unfinished) with my Swoon scraps and they were in some of my partner's favorite colors. I opted to quilt it with match stick quilting, using white Aurifil 50wt thread. This was the first time I didn't worry about my lines being perfectly spaced and perfectly parallel and I love the effect. For the binding I used some of my favorite Alison Glass fabric which coordinated well with the colors in the quilt. 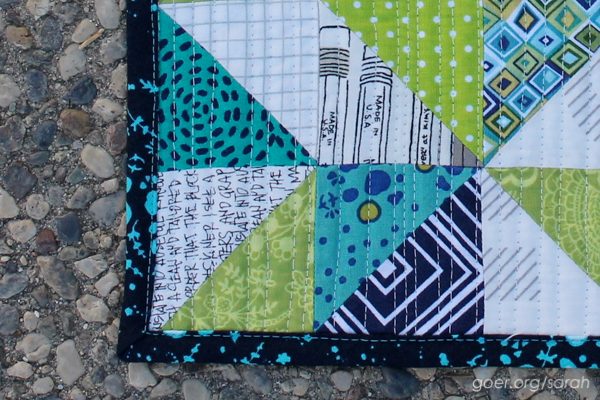 I didn't have a navy blue thread, so I opted for turquoise (Aurifil #2810, 50wt). I love this effect, but it did make the imperfections stand out. You'll see lots more photos of this binding when I get my binding tutorial up on the blog. Yesterday I also received this amazing swap package from Ginny! I love the big mini and the mug rug. Plus mini charms, chocolate and a fun wind-up toy. So excellent! 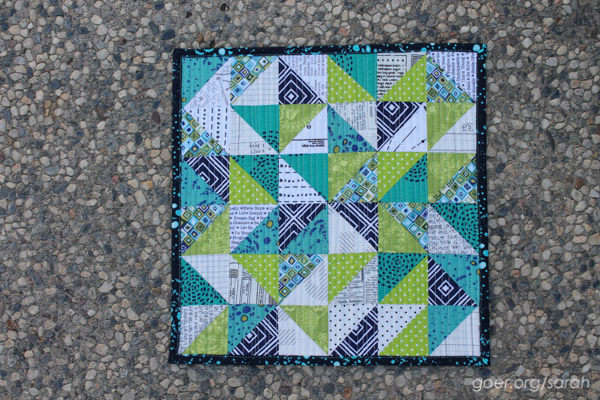 I'm linking up to TGIFF, Fabric Frenzy Friday, Link-A-Finish Friday, Finish It Up Friday and Adrienne's 2015 Q4 Finish Along post. See all my Q4 goals here. Posted in Quilting. 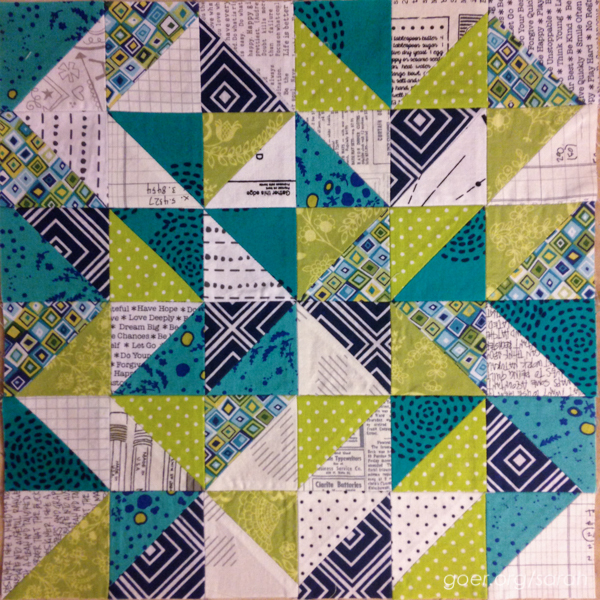 Tags: mini quilt, quilt swap, Sew My Stash Mini Quilt Swap, sewmystash2015 on October 16, 2015 by sarah. 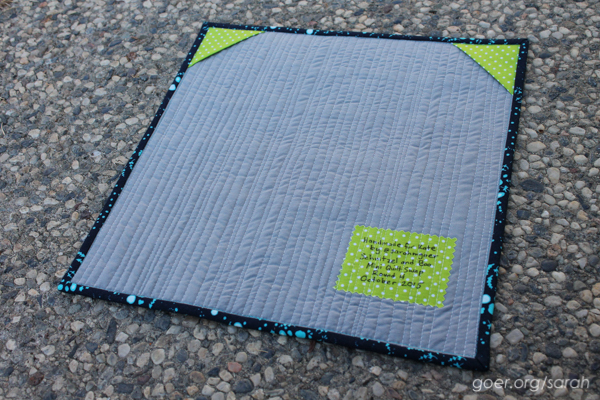 Using bonus HSTs for the mini you made was a fantastic solution, and the Alison Glass binding really does pull it all together. It can be hard using contrasting thread on a binding for sure; I am really amazed at how crisp and straight some folks seem to be able to get their binding seams (not me)! You did a great job! All the projects looks great! I can see why you wanted to keep the pouch! Thank you, Marji. I'll be doing more of this quilting on future projects for sure. It takes a while (forever if it were a large quilt), but I love the effect! I really like that little bag you made. Awesome colors! And the cute little mug rug you got in return is also pretty. What a great swap! Thank you, Rachel. It was a great swap. I thought I was going to take a break, but I don't think I can resist the Rainbow Mini Swap (round 2) that opens next month. I have a lovely rainbow dresden mini from round 1. Thanks. I'm pleased to have made a bit of swoon progress (to get the bits I needed for this project). I'd say blocks 2 and 3 are perhaps 50% complete. Just gotta knock out some of these older projects so I can get back to those blocks. What a great idea to make HST's from pieces that you're cutting to cut off anyway. 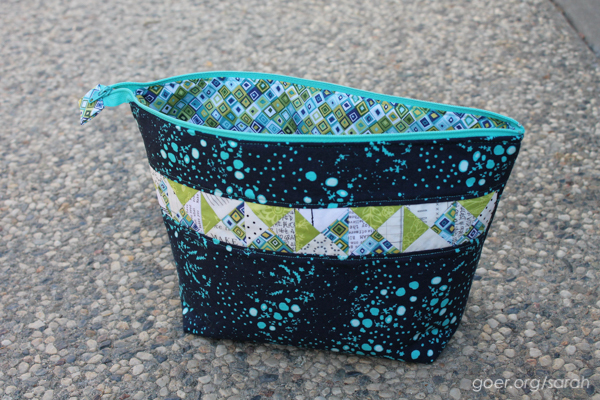 I love your projects...the QST on the zippered pouch was a very good idea. Thanks, Anja. I generally throw the HSTs into my "orphan blocks and pieced parts" box. I should dig in there for small projects more often. Lovely mini and pouch! I am doing the same thing with my Swoon and am hoping to make some matching pillow cases to go with it. If I ever get it finished that is! Matching pillows would be fun. I thought about making a throw pillow to go with my swoon quilt. There will certainly be enough HSTs for that. ;-) I have about a million HSTs from the baseball quilt I'm working on. It's a gift quilt (11 years in the making! ), but now my son plays baseball, so he's probably getting a throw pillow as well. :-) HSTs for everyone! I see your Swoon is #1 on your WIP list. How far along is it now? The minis you send and received are so pretty. 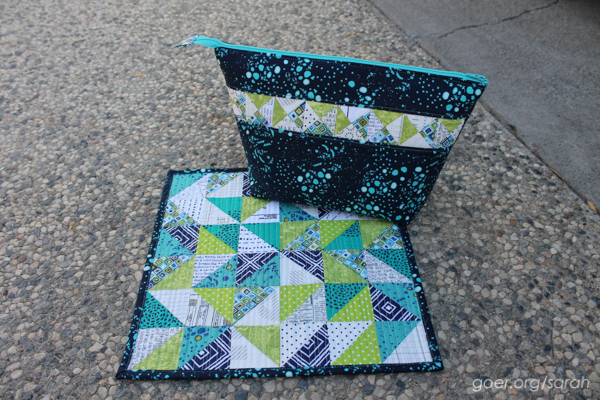 I love that you used some of the hsts in the pouch you sent as an extra. It made for a really lovely gift. Thank you. 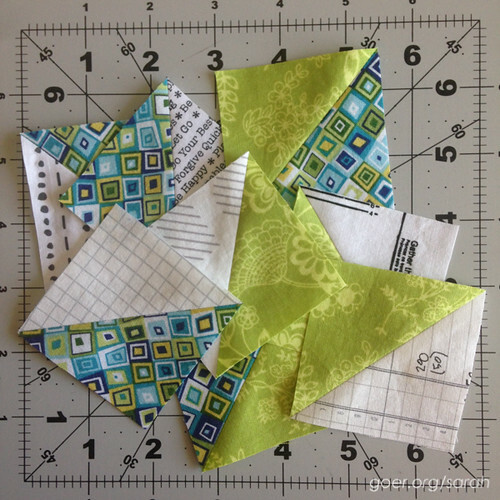 I need to remember to dip into my HSTs and other extra blocks for future swap extras and small gifts. They are all so fabulous! 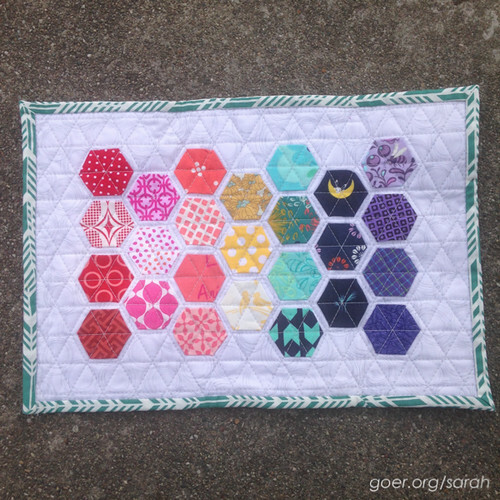 I love the hexie quilt especially!